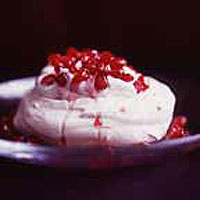 Halve the quantities if you'd like fewer pavlovas but they keep well in an airtight container for a week or so. Preheat the oven to 180°C, gas mark 4. Line 3 baking trays with baking paper. Draw 6 x 10cm circles on each. Beat the egg whites and salt until satiny peaks form. Beat in the sugar, a spoonful at a time, until the meringue is stiff and shiny. Sprinkle over the cornflour, vinegar and rosewater, if using. Fold in. Mound onto the baking trays within the circles, smoothing the tops and sides. Put in the oven and immediately reduce it to 150°C, gas mark 2. Cook for 30 minutes. Turn off the oven. Leave the pavlovas inside to cool completely. If you've got an electric oven, open the door. Halve 2 of the pomegranates and juice them. This is easy with an electric juicer, but manageable with a normal citrus juicer. Put the juice into a small pan with the lemon juice. Bring to the boil and simmer for a few minutes or until syrupy. Leave to cool. Whip the cream until thick but not stiff. Remove the meringues from the baking sheets and place on serving plates. Pile on the cream. Halve the other pomegranates. Hold one half at a time over a bowl and bash with a wooden spoon so the seeds fall out. Scatter generously over the meringues. Drizzle about ½ tsp of the pomegranate syrup over each, and serve.